My winter (well, it is winter here) white Sewaholic Belcarra. 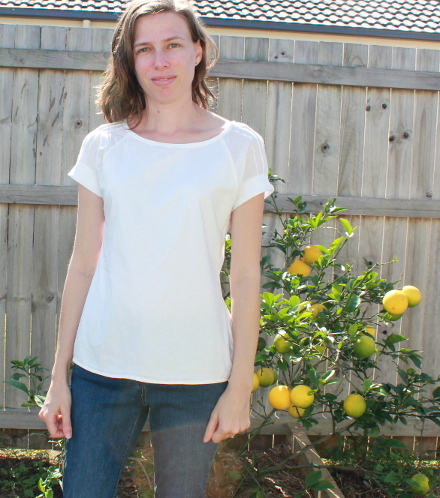 Because if you’re Aussie, you have to have a photo next to your lemon tree in the backyard. Yes, there is a hills hoist and a garden shed off camera to my right. I’m not usually at the forefront of sewing up patterns as soon as they’re released. When the Sewaholic Gabriola was announced I flicked past it, not interested in anything maxi (am I the only mum who feels that way?). But the top Tasia was wearing – I couldn’t get that out of my head. And sure enough it was announced that it would be the next Sewaholic release, I’d just have to wait around 2 months. What? I waited patiently… I lost interest… I didn’t pre-order… but when it was released… “Add to cart”. This white one is my second Belcarra make. I made the size 0 with a couple of adjustments. I brought the shoulder seams forward a touch. I also bound the neckline at 1/4 inch instead of 5/8 inch as the original neckline is too wide for where my bra straps end up. I think I added about 1 inch to the length, as I did a baby hem instead of the suggested hem length. I underlined the front and back pieces as the white voile I used is a bit sheer. I sandwiched them between the sleeve pieces which creates a very white line at the seam. Let’s call that a design feature. I also realised that most of my bra strap lands under the sleeve pieces which aren’t underlined. Let’s call that a design feature too. I love the turn back cuffs and how they shape the end of the sleeve. I don’t love the fold of fabric that appears around the underarm – any ideas how to get rid of that? I’ve seen it in a lot of other makes on the interwebs, so maybe that’s just fabric choice or how raglans work. 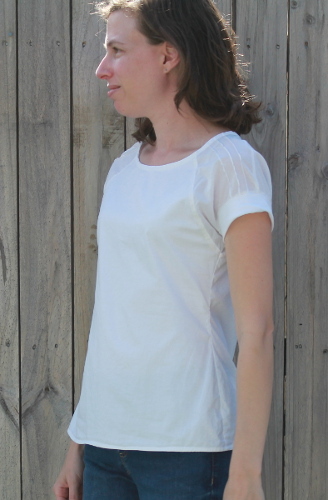 Pattern: Sewaholic Belcarra, View B sleeves and View C cuffs, size 0 with forward shoulder adjustment and smaller neckline. Purchased from Sew Squirrel (my favourite Aussie independent pattern retailer). This entry was posted in Sewing for me and tagged Belcarra, Sewaholic patterns, tops on June 13, 2014 by B stitching. This is lovely. I especially like the sleeves, I want to make one just like this.